Timothy Wilkes from Ohio, filed a testosterone drug personal injury and product liability lawsuit in the U.S. District Court for the Northern District of Ohio. According to Wilkes, the side effects of the popular testosterone replacement medication, AndroGel caused a deep vein thrombosis or a blood clot in his legs that traveled to the lung, causing a pulmonary embolism. 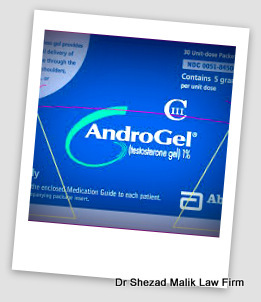 There are almost 3,500 testosterone lawsuits filed in the federal court system, alleging injuries caused by the side effects of testosterone drugs, including AndroGel, Testim, Axiron, Androderm and other variations of gels, patches, pills and injections. According to the lawsuits, the drug manufacturers touted the testosterone replacement drugs without providing warnings of an increased risk of heart attacks, strokes, pulmonary embolism, deep vein thrombosis or other cardiovascular injury. Furthermore, the plaintiffs allege that the aggressive advertising on television, magazines and print ads encouraged the men to seek testosterone drugs prescriptions as a lifestyle change to combat the natural effects of aging. According to medical studies, testosterone is only indicated in men who have been diagnosed with hypogonadism, of which there is less than 1 million affected men in the United States. All complaints filed throughout the federal court system have been centralized for pretrial proceedings before U.S. District Judge Matthew Kennelly in the Northern District of Illinois, as part of an MDL. The MDL process is common in pharmaceutical and product liability cases, where there are a large number of plaintiffs alleging similar claims. The MDL allows for the streamlining of the lawsuits, standardized discovery, early bellwether trials and a push for settlement negotiations. As part of the coordinated discovery, a group of Androgel cases are being prepared for early bellwether trial dates in 2016. Trial dates for three Androgel thromboembolism cases have been set for October 31, 2016, December 5, 2016 and January 9, 2017. The three Androgel heart attack cases are set for February 13, 2017, March 20, 2017 and April 24, 2017. According to a November 2013 Journal of the American Medical Association study, older men who began taking testosterone drugs had an increased risk of cardiovascular events, including heart attacks, strokes and death. In a 2014 medical study in the journal PLoSOne, found that side effects of testosterone drugs may double the risk of heart attacks for men over the age of 65, and as double the risk for younger men with a prior history of heart disease. In a 2015 study in the journal Pharmacotherapy found that first time testosterone users may be 40% more likely to have a heart attack when compared to men who did not use the drugs. The FDA announced a warning label update for testosterone drugs in March 2015, highlighting the link between testosterone drugs and heart disease. According to the FDA, testosterone therapy should be limited to men medically diagnosed with hypogonadism, a rare medical condition characterized by low testosterone levels.